All transactions are safe and secure with a reliable history in online purchasing behind each of our associates. 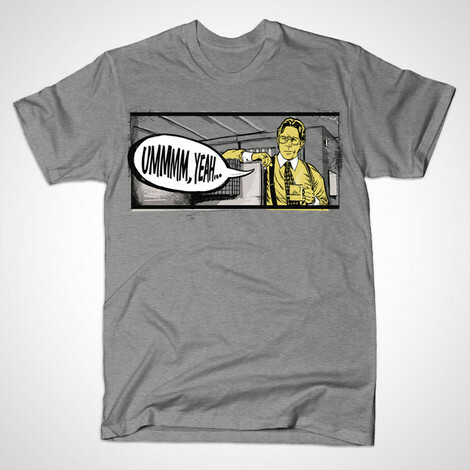 Buy the Lumbergh Office Space t-shirt to own Office Space clothing and merchandise. Ummmm, yeah, I'm gonna need you to go ahead and come in tomorrow. So if you could be here around 9 that would be great, mmmk... Bill Lumbergh has some of the best Office Space quotes. These Lumbergh t-shirts feature him standing over a cubicle holding an Initech mug. The quote is available on numerous types of apparel. This includes both men's and women's style tees. In addition to the Lumbergh Office Space tee above, browse the Office Space Clothing Gallery for more apparel like men's and women's clothes, kids shirts or hoodies.